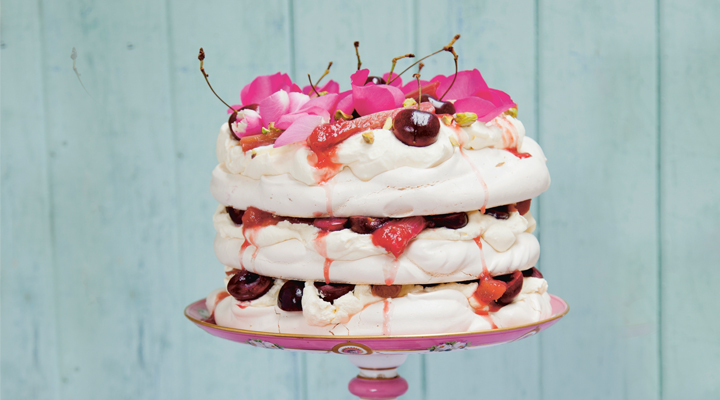 With three layers of meringue sandwiched and topped with fresh cherries and poached rhubarb. this gluten-free cake is sure to wow guests for any summer gathering. Draw a 20cm circle on each of 3 large sheets of non-stick baking paper, then place each sheet on a large baking tray. Flip the paper over so the pencil or pen mark is on the underside. Using an electric mixer and a spotlessly clean, dry bowl, beat the egg whites until they form stiff peaks. While whisking, add the sugar a little at a time until the mixture is thick and glossy. Add the vinegar or lemon juice and whisk again briefly. Put a dot of the meringue mix under each corner of the baking paper to stick it to the tray. Divide the mixture evenly between each circle. Spread the mixture to the edges of the circles, making pretty waves and swirls as you go. Bake in the oven for 1 hour. Turn off the heat and leave to cool completely inside the oven. Meanwhile, to cook the rhubarb, cut it into 8cm lengths, cutting in half lengthways if thick. Place in a wide saucepan and sprinkle over the sugar. Split the vanilla pod in half and add to the pan along with the orange juice. Cook gently for 6 to 8 minutes, stirring occasionally, until tender. Remove from the heat, pour into a cold bowl and leave to cool while the meringues cook. When ready to serve, softly whip the cream. Halve and pit two-thirds of the cherries, reserving the remainder with stalks on for decorating. Dab a little cream in the centre of a cake stand or plate and sit a meringue layer on it to stick it down. Spread one-third of the cream on top, arrange one-third of the rhubard over and scatter over half of the prepared cherries. Repeat these layers twice more, using the whole cherries on top. Drizzle a little of the rhubarb syrup over, serving the remainder in a small jug. Roughly chop the pistachios and sprinkle on top along with some rose petals, if using, and serve.